Raayu bath soak wasn’t hot ! Now it is cold everyday nevertheless now is already in May and I wanted to take hot bath. 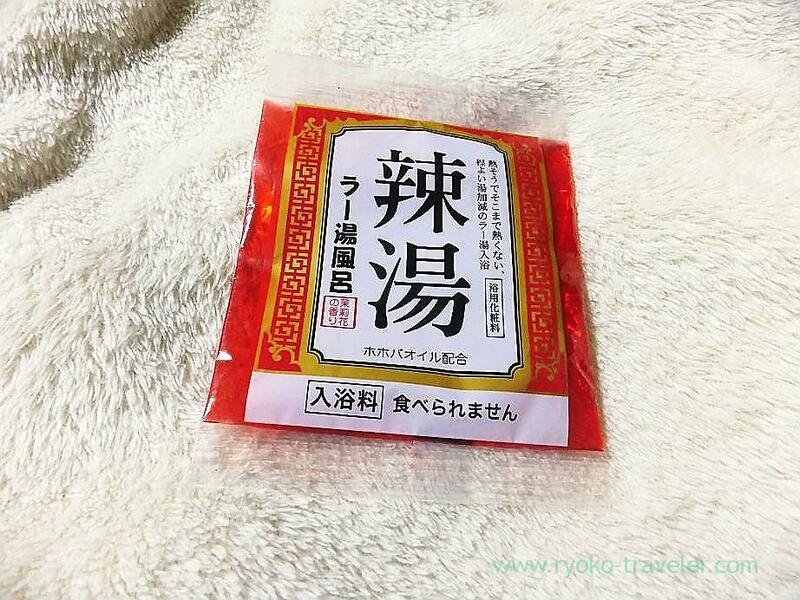 Spicy raayu (chili oil) is my delight seasoning. When I saw it at the store, I couldn’t help taking it. Though the price was 210 yen, the store sold it for just 50 yen because they wanted to put new products. I usually don’t like bath soak that have foods’ smell or contain ingredients of foods (especially, sweet fruits and confictionery), but I like chili pepper bath only. Raayu is similar to chili pepper in its effects. As same as chili pepper bath, I expected I’ll get wamer thanks to the bath soak. Recently I felt chill. I felt I’m going to catch a cold ! But contrary to its looking, it smelled jasmine and water became milk color. Also it have jojoba oil. It was milder than expected. And to my great disappointed, this bath soak made bathwater lukewarm… ! I liked this texture of bathwater, but if you want effects of bath warming, I recommend you use another one.